Kamil, my fellow player from Warsaw, decided to bring his Jaga-Jaga shooting list. We rolled for the scenario and off we went. I put my Archangel slightly closer to the left side, Warmongers with Gorag on the other and Chosen in the middle and to the left of AA. Kallus2, proxied with equally terrifying Thag2, was deployed centrally alongside with Golab. Kamil deployed his two Battle Engines on the flanks and all his stuff between those two towers. 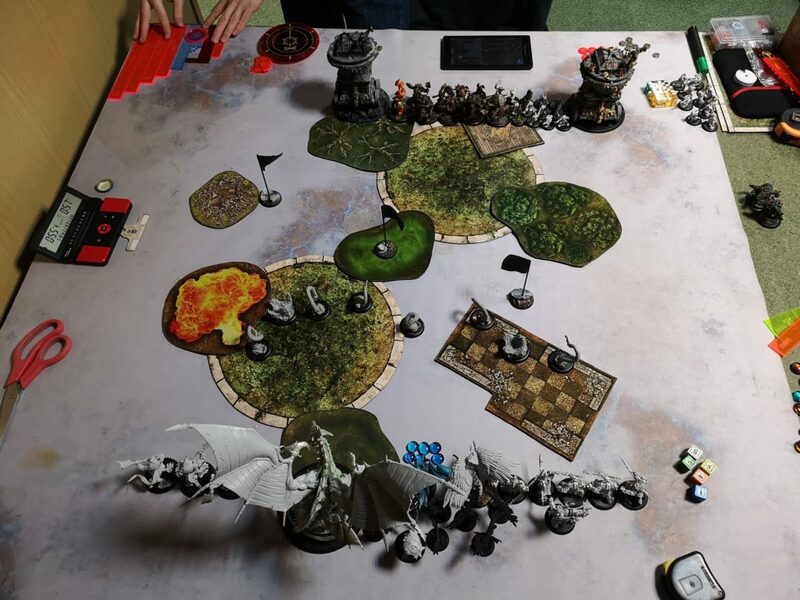 I deployed my Hellmouths after carefully measuring his threat ranges, as I didn’t want to lose them in the first round. It is quite important when deploying models that can be deployed in the middle of the board – not to over extend. 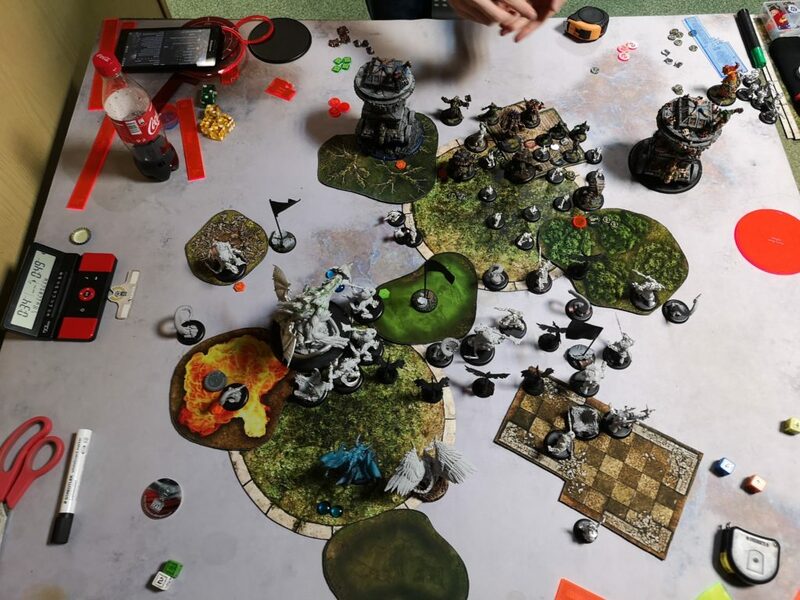 They can get much more work done being deployed a little bit back throughout the whole game, than deployed at maximum distant and dying in forst two rounds 😉 that’s a mistake I was making a lot at the begining of my adventure with Legion. 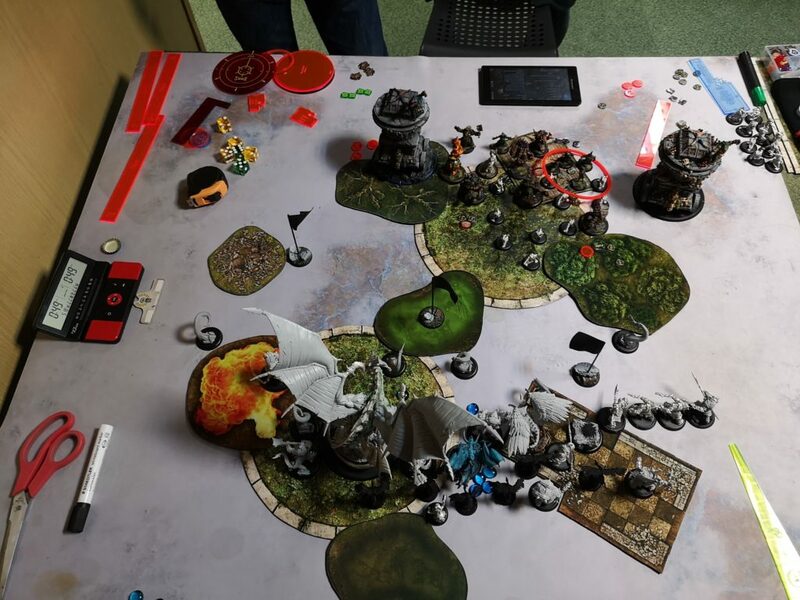 I moved my stuff forward and tried to stay outside of the range threats. I have superior charge ranges, so there was no need to move too far. I should have cast Blazing Path so my Chosen wouldn’t get caught on fire. I believe that conservative Turn 1 was the way to go, since Jaga-Jaga can increase the range damage. Kamil didn’t want to put himself at risk either, so we ended up equal on clock at that point. Kamil decided that was going to be his feat turn, but first both ambushed Husks showed up on both sides. Shamblers ran forward and he blew up 5 or 6 of them and killed many of my contesting models and most of my Warmongers. He also managed to force Ammok to tough, that he passed 😉 Kamil decided he would get better value from killing another Chosen than from finishing already corroded Ammok and not giving me another point. I’m not sure if said Chosen died, though. Kamil scored one point in his zone and I scored 2, in my zone and on my right flag, thanks to Ammok. Spitters didn’t frenzy, sadly. 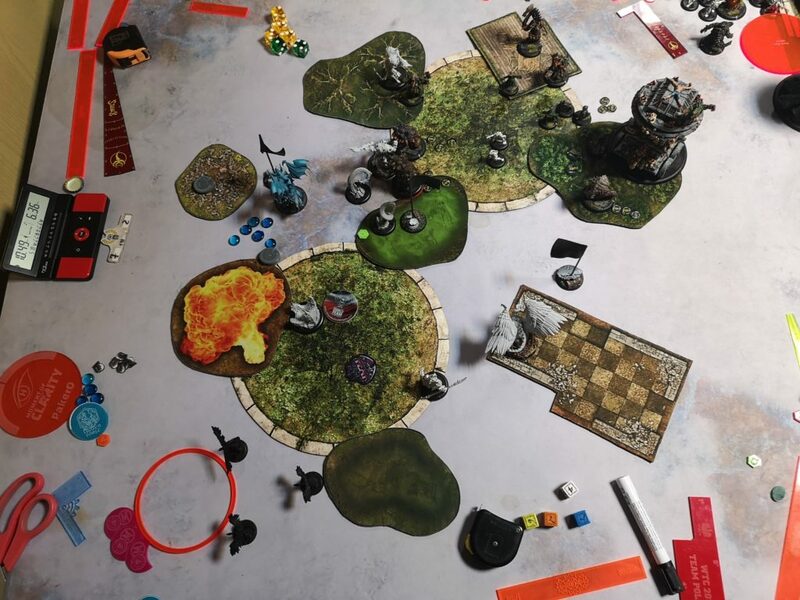 Kamil managed to kill those two engaging Chosen before beasts activated and those two beasts combined killed the dragon. 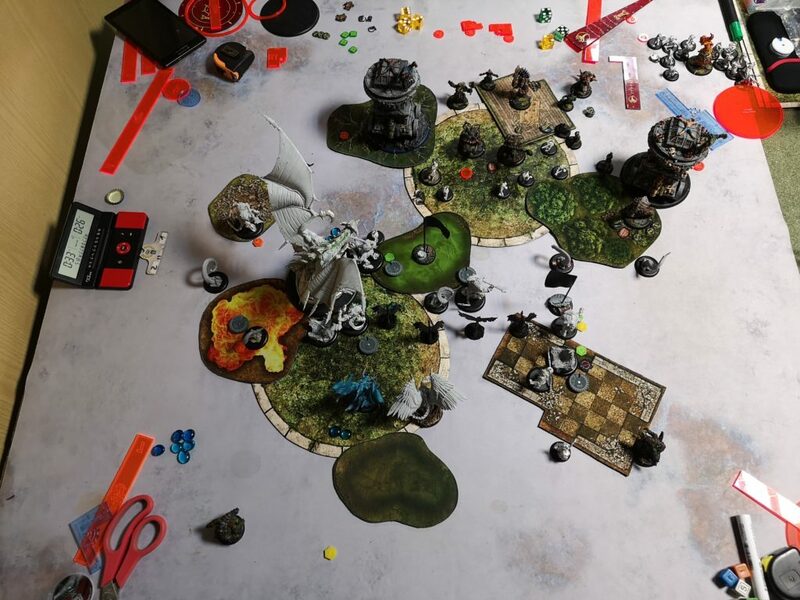 Sacral Vault finally killed my rightmost Hellmouth, but Golab was still contesting the flag. Husk was able to ran into my zone, but first he had to receive two free strikes, that fortunately were enough to kill him. Kamil scored only one point, by scoring his circular zone and I scored one point in my circular zone, 5:2. I just needed to contest the zone, capture the flag and remember to put last Warmonger alive to my zone, what I did. I scored 2 more points and we shook our hands. I really enjoyed that game, as it was particularly focused on the scenario. 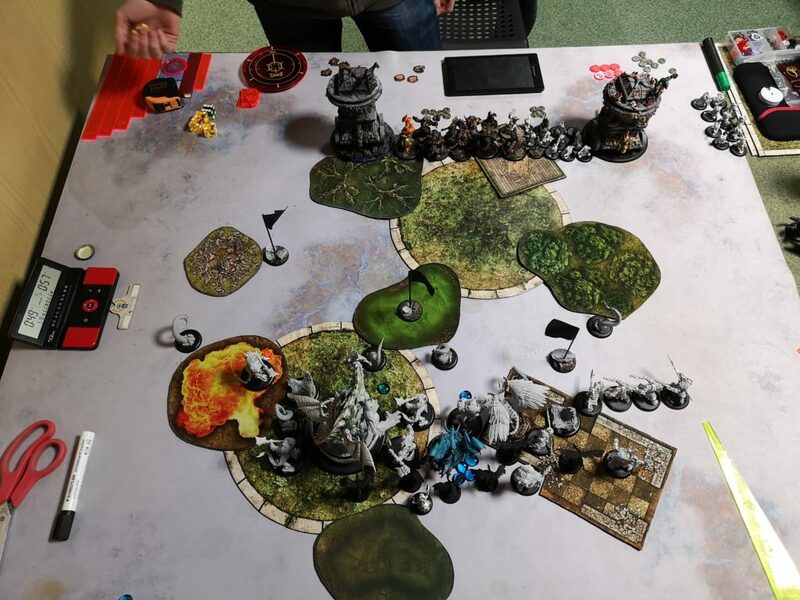 I engaged the way I wanted to and kept my crucial models alive, sometimes with help of my lucky dice 😉 I was so happy to finally put both Kallus2 and Archangel on the table that I will definitely keep on playing with that list! As it comes to the match up, I think it is most important to keep those important pieces alive long enough, so they would be able to get the work done (for example deploying Hellmouths in the right spot). I am not satisfied enough with what Golab was doing the whole game. 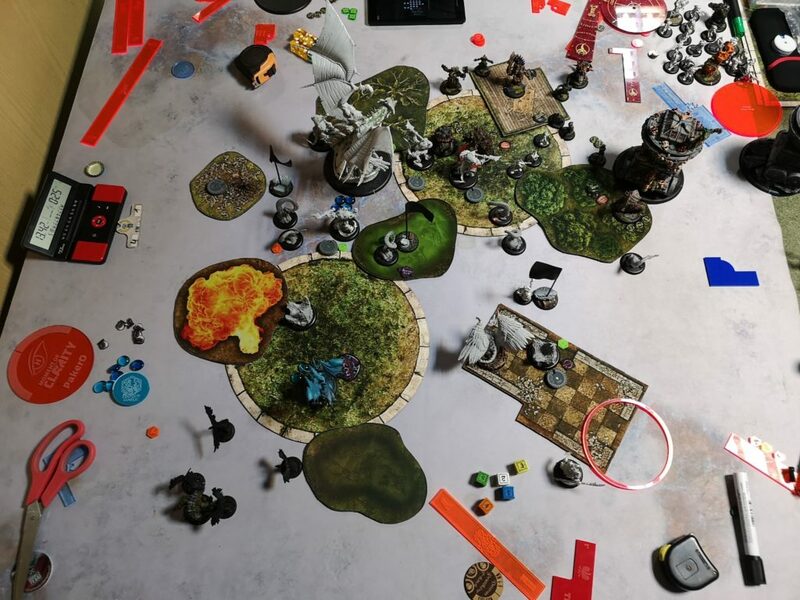 I probably should have charged in with him, or give Kamil a choice – killing damage dealing models (like Chosen or Warmongers) or killing Golab. At the end my gamble payed off, I scored enough points and he didn’t even need to deal a single damage point. I suffered from having only 6 fury on Kallus and I think it’s his most important flaw. All in all, I love the list and Kallus2 and I will explore his potential for sure!